We are the first and only Muslim community in Naples, Florida. Our community’s history is a reflection of the growth and dedication of our congregation. It all started in 1993 with two brothers praying at one of the brother’s home. In three months, attendance for Jumma prayers went from two brothers to eight. For the next ten years, as our numbers grew, our search for the perfect location took us to many places including a vacant townhouse generously volunteered by one of the brothers, to the most unlikely place: an empty automotive garage at a Citgo Gas Station on Davis Boulevard where our membership continued to grew to twenty members. In September, 09/01/2009, we finally found our current location at 2795 Davis Blvd Unit “D.” This place was an old Beauty Parlor which had to be demolished and rebuilt as a Musallah. For thirty days, two of our brothers donated their time and worked to transform the old beauty parlor to our Musallah. Ten days after the start of Ramadan of 2009, we moved into our new Musallah. 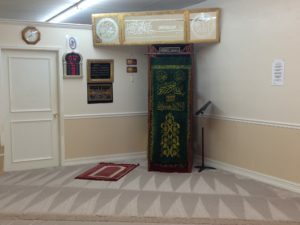 July of 2012, we leased the property next to our current location to provide our Sisters their own place to pray in privacy. Our Musallah consists of two units and is a total 2200 sq. Ft. We have a total of three (3) restrooms and one (1) full bathroom with a shower. We also have a small office space used by committee members and our Imam during Friday prayers. Today we perform Fajr, Maghrib, and Isha prayers daily, as well as Friday prayers and have over sixty-five (65) members. During Ramadan we have Taraweeh prayers daily and Iftiar every Saturday and Sunday. Our Eid prayers are usually performed on an off-site location.